"Ye adulterers and adulteresses, know ye not that the friendship of the world is enmity with God? Pat Robertson, Chancellor and founder of Regent University allows Catholic masses and even The Red Mass in his school. The Red Mass honors Thomas More who is the murderer of William Tyndale. William Tyndale is the first man to translate the Bible from the best Greek and Hebrew manuscripts in the world. If that isn't enough, Pat Robertson endorsed Rudy Giuliani for president in 2008 . Rudy Giuliani is a cross-dressing, pro-homosexual, pro-abortion Knight of Malta. Congressman Paul "Pete" McCloskey, Jr., who served with Robertson in Korea, wrote a public letter which said that Robertson was actually spared combat duty when his powerful father, a U.S. Senator, intervened on his behalf, and that Robertson spent most of his time in an office in Japan. According to McCloskey, his time in the service was not in combat but as the "liquor officer" responsible for keeping the officers' clubs supplied with liquor. Robertson filed a $35 million libel suit against McCloskey in 1986. He dropped the case in 1988, before it came to trial and paid McCloskey's court costs. "ROBERTSON'S LIBEL SUIT BY JUDGE EX-CONGRESSMAN RULED THE LEGAL VICTOR". Philadelphia Daily News. March 7, 1988. p. 14. "VIRGINIA BEACH, Va., April 02, 2005 -- I am deeply grieved as a great man passes from this world to his much deserved eternal reward. John Paul II has been the most beloved religious leader of our age – far surpassing in popular admiration the leader of any faith. He has been a man of great warmth, profound understanding, deep spirituality, and indefatigable vigor. It was my great honor to meet with him at the residence of my good friend, Cardinal O’Connor, in New York, and to sit in the Consistory during the mass he conducted in Central Park. I told him at the time how much the American people loved him, and he merely smiled. That love was shared not only in America but by millions all over the globe. He has been a steady bridge in the transition of Eastern Europe from communism to freedom. His personal magnetism brought together all Christians in new bonds of understanding. This is a partial transcript from "Hannity & Colmes," April 4, 2005, that has been edited for clarity. SEAN HANNITY, CO-HOST: Joining with us now with more on how Christians around the world are reacting to the news of the death of Pope John Paul II is the chairman of the Christian Broadcasting Network, the Reverend Pat Robertson. Reverend Robertson, did you ever meet the pope? REV. PAT ROBERTSON, CHAIRMAN, CHRISTIAN BROADCASTING NETWORK: Yes, I did. I had a wonderful meeting with him. My friend Cardinal O'Conner (search) had a reception in his residence when the pope came to New York and they had that wonderful mass in Central Park (search). And I was in the consistory with him and the other officials of the church. It was a very moving thing. It was sort of a hazy, drizzly day, you know, but the man was incredible. Just absolutely incredible, Sean. HANNITY: You know, a lot of people, Reverend Robertson, forget that at different times, I mean, this pope was criticized for standing for those traditional values that you speak so often of. And he showed a boldness in his stance against communism, obviously, and people seem to forget that now. But I mean, isn't that the reason -- that leadership quality -- isn't that one of the main reasons why he is so loved and missed today? ROBERTSON: Well, we certainly was loved by the evangelicals, because he held to the tenants of the faith that we all admired. And we thought of him as like a rock, a bulwark, against some of the shifting tides in a very highly secularized society. He stood for moral values. He stood for the eternal principles. He stood for the sanctity and dignity of life. And we were just thrilled to have somebody, in a sense, alongside of us and that we could be alongside of him. And I think it drew the Catholics and evangelicals much closer together because of him. HANNITY: You know what, Pat? One of the reasons, obviously, this is so much more that the Catholics and evangelicals agree on, core principles, than that they disagree on. And I think that was highlighted by this particular pope. One of the things I want to ask you about is there is an ideological struggle even within the Catholic faith over issues of abortion, women priests, whether priests should marry. 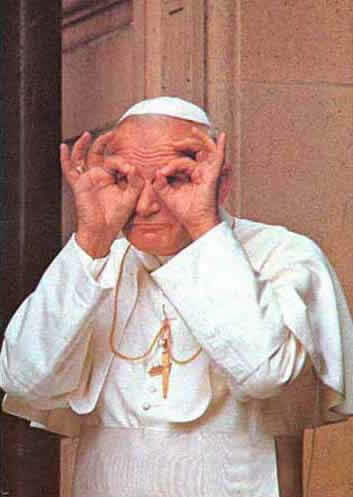 There is a lot at stake in the selection of the next pope, ideologically speaking, philosophically speaking, et cetera. ROBERTSON: Well, I hope they follow down the same line as this pope has set forth. He was a man of such strong conviction. You know, some of the things may be peripheral. I think whether or not priests marry, that's a matter of debate. But the essential truth of the deity of Jesus and the role of the church and the power of almighty God and the authority of the Bible, these are the things that he believed in so strongly. And the sanctity of life. I think these are things that all of us need to agree on. ALAN COLMES, CO-HOST: Reverend, it's Alan Colmes. Good to have you on our show tonight. Thanks for being here. COLMES: I saw your statement upon the death of the pope, and you talked about meeting him in Cardinal O'Conner's residence and also sitting through a Mass he conducted at Central Park and talking to him about loved he is, was in America. Tell us about what you said to him and how he responded. ROBERTSON: Well, the man was so tired, Alan. You know, I was considerably younger. I'm not that much younger than he was. I mean, maybe like nine years, but nonetheless, I saw him engage in -- I mean, just an incredibly brutal schedule. I said, what are they doing to this poor man? And he was exhausted. But he was holding up. And I said to him, I said, "You're holding this -- the American people love you. We love you. And I just want you to know that." And you could just see that warmth in his face, the smile in his eyes and how much he appreciated that. And I think that was a reflection in my opinion of what -- what he'd been experiencing in New York and what I had seen. I was also in an audience over in Rome. And I saw the people just absolutely adore him in Italy. But it's not just Italy. It's around the world. Everywhere he went, there were millions and millions of people who just loved him. ROBERTSON: Well, I think so, but he didn't do it by any kind of doctrinal compromise. I mean, he held to some things that perhaps the evangelicals might not totally agree with, but that's OK. But the man had principles. And that -- you know, the thing that we look for in a spiritual leader is somebody who is deeply spiritual, and he was deeply spiritual. He was a man of great personal piety and personal faith. That's the kind of leader that all Christians look for. They want somebody who really loves the Lord and shows it in everything he does. And that's -- so he didn't compromise in order to just say, I'm going to tone down my message to please the evangelicals or to please the Jews or to please some other group. He didn't do that. He held to his principles but yet there was love in his heart toward all people. COLMES: And you felt that love. People who met him would say they really felt that love and that very strong presence when they met him. Is that what your experience was? ROBERTSON: Exactly. And you know, when I walked up the steps to that Mass, he was standing at the top of the steps. And he greeted me along with all the others. There were archbishops and cardinals and bishops and others. And you just could see it as he gripped your hand, there was love in his face. And yet, all these people, everybody pulling at him, everybody wanting a piece of him, and yet he was always so strong and always so warm. That, to me, was extraordinary. It looks like to me he would have been exhausted. Yes. HANNITY: Pat, thanks for being with us. Appreciate it, as always.